In this article I will teach you the fundamentals of Pay Per Click digital advertising. We will mostly be looking into the flagship product of Google called Adwords. About 96% of Googles revenue is generated through search advertising which is directly connected to Google Adwords. This product is extremely important especially for small business owners who relay all their marketing on only Adwords. Google Adwords consist of the search network and the display network referred to as (GDN), Google Display Network. Let’s start by taking a look at the biggest part, the search network. 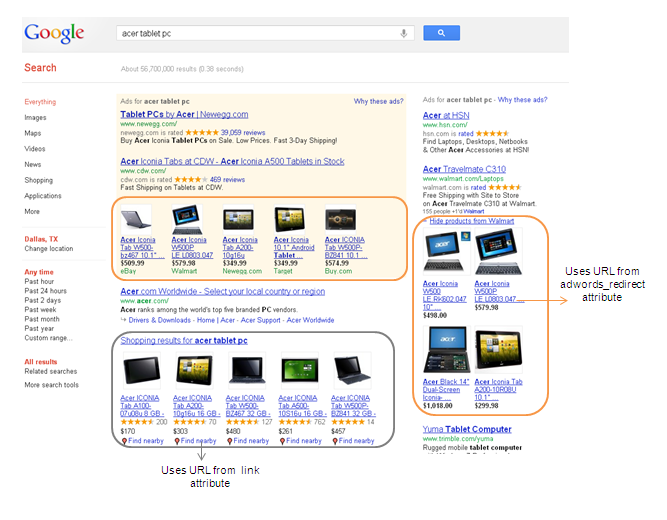 The search network is as seen above, the ads shown in the actual search engine (Google) highlighted in the red boxes. This kind of marketing is effective because it targets an user who is on active research after a ”klänning” (dress) in this case. As you can see in the image above the visitor can both see ads (marked within red boxes) and organic search results. Nowadays the organic results are really good. But for companies who are lacking organic results (free) their only option is to be advertising in the paid spots of Google. This costs money (every time someone clicks the ad) the company will have to pay a CPC (Cost-per-click) fee to Google. The positive thing about this for the advertiser is that he has tons of options to analyse, optimise and customise the campaigns. The advertiser has the power to do advertising for the right person at the right time at the right place. This also allows the advertiser to add additional links beneath the ad (site links), phone numbers and addresses. For instance the phone number beneath an ad is interesting, this makes it possible for searchers to directly make a call to the company by clicking on the phone number, even without having to visit the advertisers website. The second part to Adwords is Google Display Network (GDN). Google Adsense is an important part of GDN, that is Google’s network where you can start showing ads on your website and start earning money when people click on them. This basically means that you will get a cut between the advertising money that flows between Google Adwords and the advertiser(client). 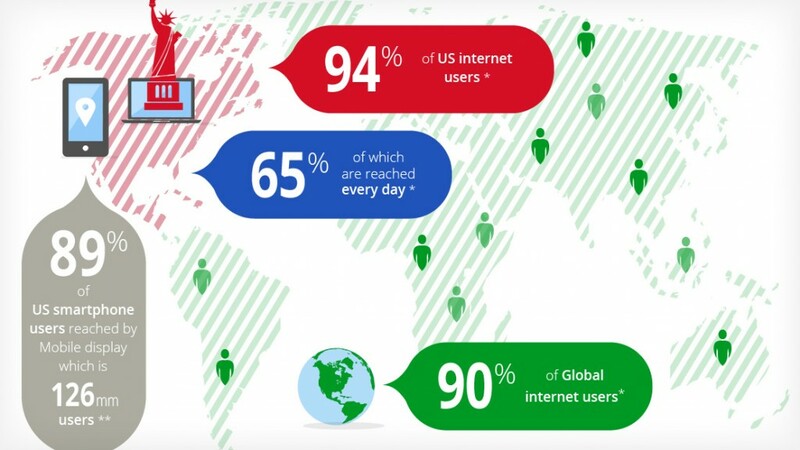 Google says that their reach via GDN is 90% of Global internet users. This means you’ve most likely seen a lot of Google Ads on different websites (not to mention YouTube). Google Adsense is the other ”half” of Adwords, so Adwords is for advertisers and Adsense for publisher who want to earn money online. Please read more in our (earn money online article). Remarketing is a part of GDN, you probably see the same video ads on YouTube and you keep seeing ads on many websites such as CNN.com as the websites you’ve previously browsed on. To summarise this with short words it means if you for instance visit Hostgator.com (hosting company) and then visit YouTube.com you most likely will see their video adverts on different YouTube videos. This is re-marketing. They ”know” that you visited them earlier, so now they are trying to get you back again. Google Display Network (GDN) is really awesome for company branding and if you find great partners in their network that drive great ROI to you, but most likely the search network is what you are looking for, at least for a start. So, how should I get started? The absolutely first thing you should do before jumping into PPC marketing is of course to set up goals and make sure your website or application is ready to convert accordingly. You can read more in our Google Analytics For Beginners article. Once you are all set with clearly defined goals it’s time to begin with the Keyword Research. Keywords are how Google Adwords works, you define your campaign according to what search-keywords you want to be shown on (or not to be related with). It’s also here we get into the ”mechy” stuff. After you’ve done your keyword mapping (described in SEO for Beginners article. Basically deciding what keywords are important for your website.) Keyword planner is the way to go. In Keyword planner you basically enter the keywords that are relevant and important for your business and you receive data in forms of: How many searches are there for this keyword per month on Google in my country? How expensive would it be to be shown for this keyword on Google Ads? How big is the competition? As seen above the keyword ”Dress” has 1 900 searches per month in Google.se (Sweden). 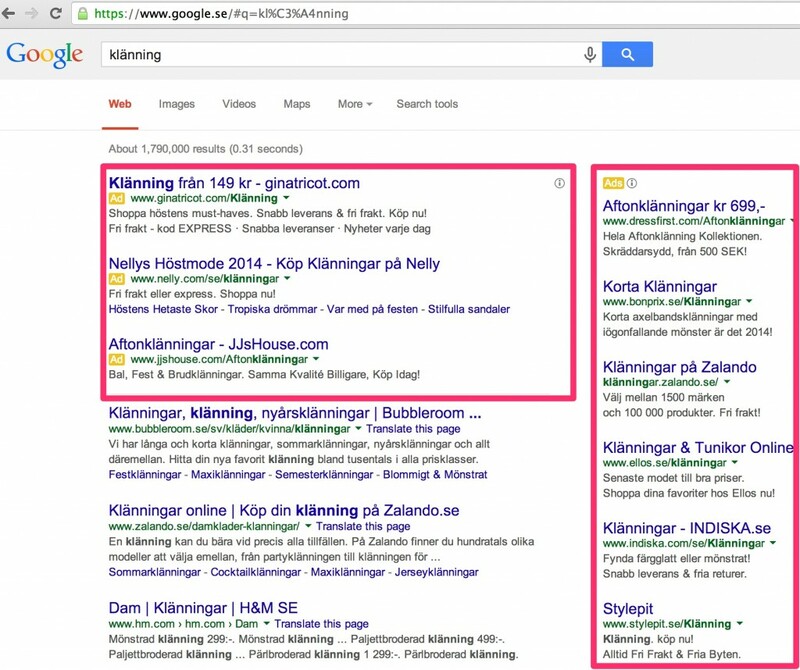 The competition (Konkurrens) is ”Middle” and example cost is 6,18 kr per click. Please keep in mind that this is what Google wants you to pay. Not what we will be paying ; ). But it gives you an average so you’ll know what costs we are dealing with. Historical data is very important when selecting keywords, but in this case we don’t have any historical conversion data so we will have to start testing with new keywords. Usually high traffic keywords are more expensive than low-traffic keywords, and long-tail keywords are often low traffic. This means the longer keyword phrase you have ex: ”white dress in Stockholm” the lower the traffic will be, the lower the competition will be and the cheaper it will be for you. The trick is to find the most converting keywords for your business with the right ROI (Return on investment). Many beginners make the mistake to not read about matching types in Google Adwords. Each keyword or phrase in Google Adwords could be matched by different types. Broad Match shows a very wide type of queries. 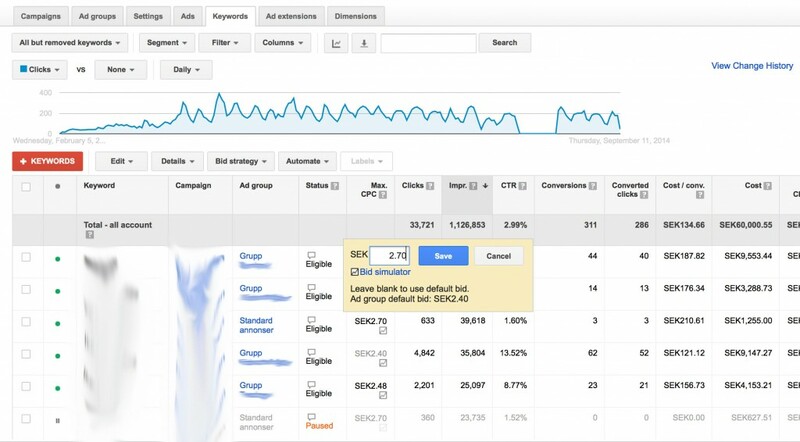 This is the most common mistake made by new Google Adwords users. For example if you enter keyword: dress in Adwords it will automatically be a broad keyword. Now, if users search for ”ugly dress” in Google your ad will show up. Very bad right? Because you will get lots of irrelevant traffic. However, this option is good for niche markets and companies that have big budgets to be shown for every query(search) within this market. Phrase match is a good option for beginners. This means if you enter a phrase ”cheap dress” it will only show your ad when a searcher is searching for something that is including ”cheap dress”. It could be like: ”nice and cheap dress”, ”cheap dress” or ”really nice cheap dress in Stockholm”. Now your queries will be more targeted to what you offer, but still not excluding other words people might use in their searches. Exact match is a rare one, but very effective if used correctly. For instance if you enter [dress] in Google Adwords this will only and exactly show when people enter ”dress” in Google. This is commonly used for high-traffic and very relevant terms. If you have a dress-shop you might want to use [dress], but be aware of that this could be expensive if the keyword has high competition, keep an eye out if its worth the investment. Negative keywords are words that you do not want to be related with. Example if you enter the word -cheap in Google Adwords, this will be a negative keyword. Now if a user searches for cheap dress in Google, your ad will not show up because you do not want to be related with the word cheap. There are extremely important when you know all the words you want and don’t want to be related with. 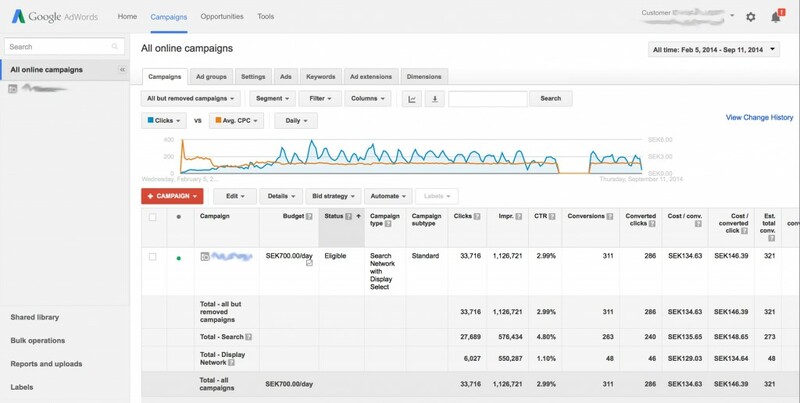 More targeted Adwords Account means more return on investment. In Google Adwords when you set up an account and campaign the ”recommended” choice is to use Automatic Bidding on Keywords. This means that Google will decide how much you should bid on each keyword. This is like letting Google waste your money, crazy right? Instead select the ”Manual bidding” option like in the image below. You will soon be able to set your own bids for your keywords. Now that is super cool and is really valuable for big accounts with thousands, or why not millions of keywords where you just don’t have the time to manually set bids for each keyword. However, in our case we have a smaller account with ca 200 keywords/phrases, in this case it’s better to manually analyse and optimise the account. You can customise your Adwords Dashboard in many different ways, for example load a lot of data points from Google Analytics. From the start you will only have a few fields such as: Clicks, Impressions (Views on your ad), CTR (Click ratio), Cost Per click avg, and total cost. Eventually you will have to load in more data to get a better overview of for instance: Conversions, Converted Clicks, Cost / converted click etc. You can for example see which of your ads is your best performer, which keywords are converting, which keywords are too expensive (bad ROI) and so on. Google Adwords is extremely powerful because of the ”revolutionising” fact that you can measure the effect instantly. It takes 15 minutes to get your first campaign up and running and you can directly start measuring the actual profit this generates, which keywords are good for your business and why/how it’s actually worth it. This seems like a good time to move forward to the manual bidding of keywords. Unfortunately I can’t show you our keywords and their matching types (blurred) but what I can show you is how the bidding process works. As you can see we have entered a custom bid to almost all keywords in the list above. Our tactic and probably the most cost effective strategy is to bid as low as possible but still to be shown on the first page of Google. If you enter a too low bid a red message will appear saying ”Below first page bid.” This means that your bid for this keyword is so low that the ad will not be shown on first page of Google results. So what we wan’t to do is to bid as low as possible but still to be shown on first page. The bids are changing all the time, as new competition arrives and so on… So it’s quite a lot work to manually keep changing to the lowest possible bid. You can read more about bid strategy in this link. Using the ”Automate” button to right of Bid Strategy it’s actually easier to create the rule since it’s pre-existing. So for Example: ”IF any keyword’s bid is too low for first-page, raise to the first page bid.” we could easily just use the ”Automate” function instead of Bid strategy button. I won’t dive in to this too much for now, since different rules apply depending on your goals. But it’s important to remember that manually bidding to be visible on the first page is a good start. The top 3 advertisers on Adwords usually pay extremely high CPC costs for their target keywords, that’s their way of doing branding. Often you get more value for the cost if you just concentrate on being visible on the first page, not necessarily the top positions. It’s important to understand Google Adwords quality score in order to press down your CPC and get better positions in the search-results. Quality Score has a couple of different factors deciding a score between 1 and 10 for the relevance and over-all quality of your ads and campaign. Basically what this does is that it gives you a score on your ads and keywords and your goal is to have a score of 10. If you have a good quality score you will get better positions and a lower click cost because Google thinks what you offer is the most relevant to that search. An scenario of bad quality score would be: ”You have an ad that is about shoes, you want to be shown for ”shoe” related keywords. But your landing-page (website where visitor comes after clicking the ad) is actually about hats and shirts.” Many big e-commerce companies often do this mistake, they do ads about certain product category but link to a generic start-page or another product category. A good scenario would instead be: 1. Shoe Ad, 2. Shoe keyword, 3. Landing-page about shoes. Now when we understand quality scores, it’s easier to understand Ad grouping and campaigns. By creating one ”Ad group” in Adwords that has ads and keywords related only to shoes you will higher your quality score. Then you could create a separate ”Ad group” if you also want to advertise ”hats” for example. By separating product categories in different Ad groups you will get better positions for better prices. Campaigns are one step back, one campaign can have several ad groups. For instance you might want to have one campaign that is directed only towards Mobile Users in the Search Network, and one campaign towards desktop users in the Display Network. With the ”Segmentation” function you can set your ad’s to display only on certain days or hours of the day. For example if there is some ad you wan’t to push in the morning, another ad during lunch and another ad in the evening this is done via ”Segmentation”. If you wan’t to read more about Adwords Day Parting you can read more here. For e-commerce websites there is a special section in Adwords called Google Shopping (earlier Product Listing Ads). This means if a user searches for example ”red dress” a red dress will appear in the search results, the actual product. Google Adwords is powerful for all types of businesses. It doesn’t really matter what market you are in or if you are online or offline. There are tons of companies surviving only thanks to Google Adwords. The best way to go about it is signing up, test initial keywords for a small budget and keep optimising with help of the data you receive both from Adwords and Google Analytics. Remember that the most important thing is that you keep an eye on the actual Return On Investment (ROI) on specific Ads and Keywords, then you can easily optimise from those insights. 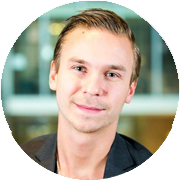 If you need help with digital marketing and analytics please don’t hesitate to contact me at Joel.tukiainen@bevace.se or call us at +46(0)8-559 26 039 – leave a message and we’ll get back to you.